As many of you know, I’m an entrepreneur at heart. I love starting new companies and projects and working alongside great people to make them successful. It doesn’t matter if it is a new dance studio project or a real estate development, I simply love to create and see things that have at one time lived only in my imagination, come to life. To me, launching a project is the most exciting form of “choreography”. This year I took on a brand new project in cooperation with our friends at Untapped Movement called the One Family Festival. The festival will be delivered in two jam-packed days complete with the industry’s top master teachers, choreographers, a business owner’s breakfast, teacher classes, a student showcase, audition experience, dance related exhibitor booths, professional headshots & tips from industry experts. 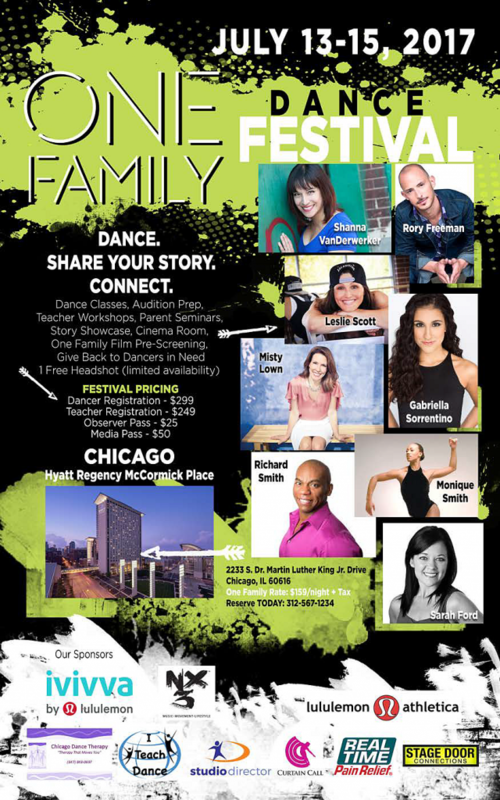 The One Family Festival is happening in Chicago July 13-15, and, YES, you can still register! We are SO excited to bring the Misty Minute community a national event that offers amazing dancing, age-appropriate choreography and a non-competitive showcase. The festival also features an on-site community service project and special workshops from amazing representatives from companies like ivivva & lululemon. I’m excited to be taking the lead in parent and teacher classes and our friends from Untapped Movement will be showing their latest film called, One Family Film, for the FIRST TIME at the event. Every dancer has a story to share (and it probably has nothing to do with trophies or “placements”). A student doesn’t have to be the best dancer at your studio to be the one who loves to dance the most. Kids are still willing to work to earn things like summer festivals. Kids can share things through movement that they could never share with their words. Refreshingly, most parents are more concerned with their child being “seen” (a.k.a. not invisible) than they are concerned with their child being “discovered”. Most parents sacrifice A LOT to make these opportunities available to their kids. Character is more important than celebrity when choosing a master teacher. True master teachers are more worried about their students than their “brand”. There is no need to have kids dancing from 7am until midnight. No need at all. 40 entries is more than enough for an evening showcase after a long day of classes. No, I won’t be winning the “Largest Dance Event of the Summer” award. But, we might be in the running for the “Most Refreshing”. It’s a simple philosophy really: People first. Provide value. Great teachers. Serve others. Give dancers time to eat, sleep and be kids. Have fun. Make memories. Love on the teachers and studio owners. Respect the parents. That’s pretty much it. Does that sound refreshing to you? Then please consider joining us!